Our language is full of quirks and idiosyncrasies which is one of the reasons it is so interesting, yet tricky to master. This week we are highlighting one of these quirks, known as the homophone. 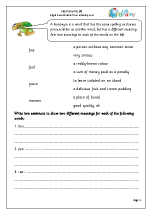 Homophones are words that sound the same but are spelt differently and have different meanings. 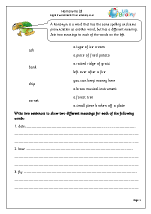 They are also sometimes known as homonyms, although strictly speaking homonyms also share the same spelling. 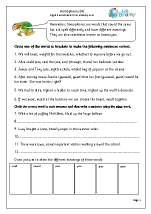 ‘Wood’ and ‘would’ is an example of a homophone and how the sound is spelled will depend on the context of the sentence. It may seem odd to have two words with the same sound but with different meanings and spelling, but one of the reasons for this is that our language has gradually evolved, deriving words and spellings from many other languages. For some children this makes spelling even trickier; for others it adds to the fun and enjoyment, including providing a great source (sauce!) of material for jokes. 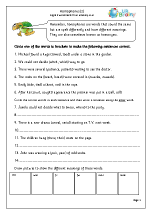 We have just published a superb selection of worksheets on homophones which are fun to do and lead children on to think of more examples as they increase their range of vocabulary. 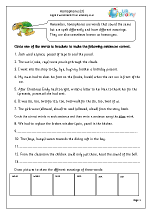 A homonym is a word which shares the same spelling and the same pronunciation as another word, but has a different meaning. Homonyms are another case of the weird and wonderful world of the English language, which makes it so much fun, yet so tricky to learn. 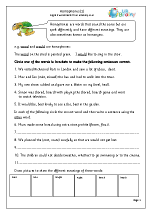 For example the word ‘pupil’ is a homonym; it can mean a school child or part of the eye. The only way we can tell which is correct is in the context of the sentence as a whole. They are often used in crossword puzzles with clues such as ‘a flower found in the eye’; answer ‘iris’. The word homonym comes from the Greek, meaning ‘having the same name’.